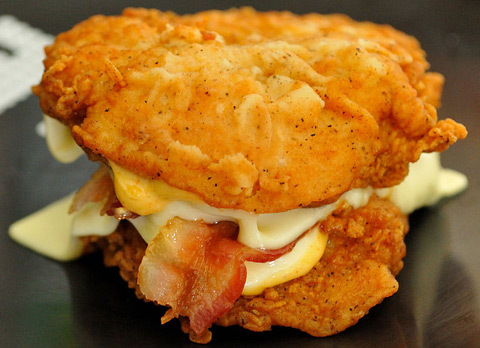 Starting April 21, the Double Down will return to KFC, reports USA Today. But the sandwich will only be available for a limited time. For those of you living under a rock (or simply not into fast-food Frankenfoods), the Double Down is a sandwich that swaps buns for two pieces of KFC Original Recipe fried chicken. Inside the sandwich is the gut-busting combination of bacon, melted Monterey Jack and Pepper Jack cheese, and secret sauce. Historically, the KFC Double Down was the hypebeast Frankenfood item that created the monster that is fast food today. Fast food has gotten significantly more insane since it launched in 2010—just look at Taco Bell’s recently-released Waffle Taco. Now that the Double Down is returning to reassert its dominance, you can have the most insane fast food meal of all time: Wake up, head to a combination KFC/Taco Bell, order a Waffle Taco, then grab a Double Down. You might die afterward, but life is all about taking risks. The biggest question on our minds is: Will the Double Down get a re-review from NYT critic Pete Wells? Sam Sifton reviewed the KFC creation when it first debuted back in 2010. USA Today also reports that KFC will launch a social media campaign that includes a nationwide “Double Down Dare.” We have no idea what that means, but we’re kind of scared. RELATED: What Do the People Think of Taco Bell’s New Breakfast Menu?